Cooked Aberdeen Angus sired beef topside, coated with cracked black pepper. Beef topside hand dressed with cracked black pepper. 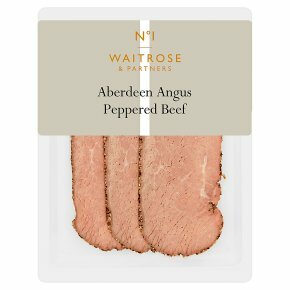 Beef sliced from whole topside joints of British Aberdeen Angus beef, which are cooked and hand-dressed with a crust of crushed black peppercorns.